Amino acids, essential and nonessential is at least 30%; the peptide is at least 30%, polysaccharides and oligosaccharides, vitamins, trace elements ... ergosterol. Treatment for: allergy - bronchial asthma – HIV – hepatitis – herpes – influenza – diabetes – dysbacteriosis – stomach diseases – burns – oncology – liver diseases – kidney diseases – prostate gland diseases – colds – erysipelas – cardiovascular diseases – traumas – tuberculosis – stresses – erectile dysfunction. According to the developer of Immunovit, Professor Vladimir Rodoman, recent research have shown that Immunovit is also effective for prevention of and treatment for atypical pneumonia and the avian flu caused by the H5N1 virus, H1N1 virus that in the near future, as a result of continuous mutations, will be able to be transmitted airily from person to person. Invigoration source for: sportsmen – university students, school children – nursing mothers – persons with impaired immunity and sexual potency – disease and postsurgical complications prevention, pre-conception child pathology prevention – workaholics – improving performance. Immunovit: patented unrivalled medical product which regulates metabolism, quickly removes immunodeficiency and restores health, is well compatible with other medicines (including antibiotics) enhancing their effect, increases serum interferon rate, improves cellular and humoral immunity, the functioning of liver and other organs, increases the haemoglobin rate and reduces ESR enabling the organism to get over the virus, improves antituberculous drugs tolerance, helps quickly recover from physical and mental activity, improves performance in sport while not being a doping. (see Antidoping Center expert opinion). Immunovit considerably increases sexual potency, restores lactation, enhances work efficiency, improves hearing, eyesight, hair growth, cleanses the skin, removes toxicants and allergy. Please note that the product is cleared for use by children from three years old and above, while other biologically active food additives may not be used by children under twelve years old. researcher and inventor. Died 06/29/2015 in Moscow. the author of over 350 works including 16 patents, supervisor of 9 Doctor’s and 32 Candidate’s theses, president of the Human Health Foundation. 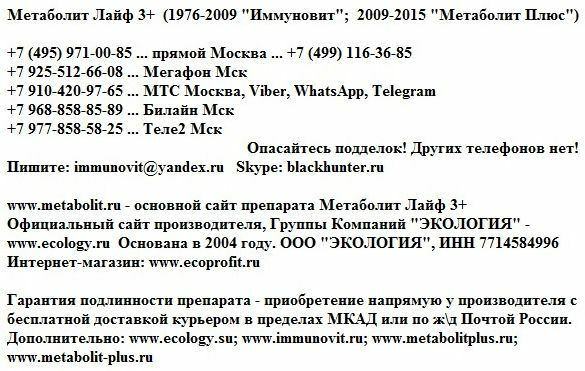 The developer of Immunovit, Professor Vladimir Rodoman has kindly agreed to inform www.ecology.ru about his wonderful product created in 1976. We present some extracts from the interview with the researcher given on February 28, 2007. - Nowadays a wide range of vitamins and vitamin complexes with microelements is readily available on the market. But the question is: do the instructions say that the assimilation rate of these synthetic vitamins equals only 10% via peroral or 20% via intravenous application? These facts, widely known in the medical profession, are withheld from the consumer. By contrast, due to the fact that Immunovit consists of natural components its assimilation rate can reach 90-95%. (It is amazing, but proof of these words by the researcher did not take long to come. See «Vitamins in Pills Reduce Lifespan»). - In the course of many years since the development of Immunovit more than 5000 performance tests have been carried out, 2 Doctor's and 8 Candidate’s theses have been defended. Over the last five years the group of scholars under the direction of Professor Rodoman has published 14 studies showing the great medical effect of Immunovit. 95% of Russians have impaired immunity, the immunity level in Russia is from 1.5 to 3 times lower than in developed countries. This is why I will not exaggerate if I say that in Russia Immunovit should be used by everyone. - When a medicine (we have no right to call it «a drug» yet) is advertised as a cure-all, it usually arouses skepticism. But Immunovit as such does not cure anything; it just invigorates the body, gives it strength and helps defeat a disease. Given rather pessimistic forecasts by epidemiologists predicting new outbursts of atypical pneumonia and other major viral infections, for example, the already mentioned avian flu virus (H5N1), improving immunity becomes extremely important. - Use of Immunovit for six months before conception can guarantee the absence of heart pathology in the new born up to 99.9%. - (Professor Rodoman shows his neatly kept files on Immunovit). I have several notable letters from the USSR judo and cycle race teams received at the end of the 70s, before the XXII Olympic Games in Moscow, expressing gratitude for Immunovit by the then senior Soviet sports executives. Many of us remember the outstanding achievements of Soviet sportsmen that nowadays serve as a perfect example to the Russian sport community. It was very interesting to learn that Immunovit made its contribution to these great results. It should also be noted that Immunovit is not a doping; this fact is certified by an Antidoping Center expert opinion. Attention! The Russian-made Immunovit by Professor Rodoman (TU 9291-005-11455465-04) consists of natural components and essential vitamins, amino acids, microelements – 47 natural components in total. Immunovit by Professor Rodoman has nothing in common with the biologically active food additive bearing the same name and consisting from 3 components that is produced by companies from US and Canada. - Does Immunovit have contraindications? It is contraindicated to persons who have individual intolerance of Immunovit’s components. - What research have proved Immunovit to be effective and safe? - If Immunovit is an outstanding medicine highly effective against many major diseases, why is it registered as a biologically active food additive? biologically active food additives which have proved their worth and are gaining recognition in Russian hospitals. It is used in the Central clinical hospital №119 of the Ministry of Emergency Situations, in a number of tuberculosis hospitals of the Moscow, Ivanovo and other regions. Immunovit has undergone approbation and has been granted an official certificate at the Morozovskaya children’s hospital, the clinical hospital of the central medico-sanitary branch № 119, the hospital of the Gazprom company, in the Moscow TB dispensary № 5, the Moscow region tuberculosis hospital, the Ivanovo region clinical hospital. - If Immunovit has so many evident advantages, why is its scope of use still rather limited? There seem to be several reasons for this. First, the Russian Immunovit by Professor Rodoman was discredited by the fact that a foreign-made biologically active food additive under the same name appeared on the market. In contrast to the Russian-made Immunovit that consists of 47 natural components, the foreign-made product includes only 3 of them. Unfortunately, the two food additives are often confused. Second, Immunovit is hard to promote due to the fact that the medical community is rather conservative and takes everything that is new with a grain of salt, especially when dealing with new biologically active food additives. Nevertheless, those doctors who have appreciated Immunovit use it actively and try to do their best in promoting it. As to Professor Rodoman, he is of the opinion that it is high time to register Immunovit as a drug with the Pharmacology Committee, elevating it to the status of a fullright drug. But, after serving in the capacity of member of this committee for 10 years he learned pretty well the fact that preparing an application for registration of a medicine as a drug involved very burdensome paperwork. And the truth is that Professor Rodoman is terribly overloaded with work: he has to exercise overall management of the clinic, perform surgery and deal with students. - How long is the course of treatment by Immunovit? There are two courses: the express course involving 4 packages per 100g, and the standard course involving 12 packages per 100g. - Can I come to your office and pay for Immunovit in cash? We are sorry, but this option is not available yet. This would require additional expenses on personnel, a cash register etc. that would ultimately result in a higher price of the product. With the lowest extra charge possible, Immunovit is available for delivery by post to any Russian address through our online shop. The delivery costs are paid by the customer upon receiving the product. - Where do you get the packages of Immunovit to be delivered to your customers? For safety reasons (there have already been attempts at forgery) we get the packages not from the manufacturing company, but directly from Professor Rodoman, as well as all the information presented on the site. Ecology.ru is an authorized dealer in Immunovit. Professor Rodoman showed certified papers about successful treatment of 3 HIV-positive patients for pulmonary tuberculosis in a course from 30 to 45 days. «I would like to draw your attention to a case of a 37- year-old patient with open pulmonary tuberculosis who developed an allergy to specific drugs and hepatitis as a complication. Treatment by antituberculous drugs was cancelled. For one month Immunovit was the only medicine administered to the patient. The X-ray showed that the cavity in the right lung had healed. The patient felt better. This proves not only the fact that Immunovit does not cause allergy but also the fact that it can alleviate it. It also improves tolerance of antituberculous drugs thus making specific treatment more effective. At the Moscow region tuberculosis hospital Immunovit was administered to 36 patients from 28 to 72 years old, with 35 of them recovering in a period from 30 to 45 days (three of them were HIV-positive). There are records of many cases of recovery from pulmonary, renal and bone tuberculosis without recourse to antibacterial drugs. Using Immunovit for treatment of pulmonary tuberculosis in 114 patients with such concomitant diseases as hepatitis, pancreatic diabetes, gastric and duodenum ulcer and HIV/AIDS resulted in a 90% recovery rate. Immunovit is a broad-spectrum medicine. At Tomsk University it is used for treatment of liver, kidney diseases and prostate gland cancer. A one-week preoperational treatment course helps avoid postoperational sepsis. Immunovit has proved to be effective against herpes of all types, allergies and the flu. It can be used in outpatient departments. A typical hospital treatment course for tuberculosis costs about 100000 rubles. By contrast, an Immunovit-based treatment course for tuberculosis and hepatitis costs from 10 to 12 times cheaper. It is impossible to quote every single comment from patients. Professor Rodoman says that in terms of size all of the reports could probably amount to no less than a medical encyclopaedia. Georgiy K.: «I had been fighting tuberculosis for three years before I discovered Immunovit. After six weeks of treatment with Immunovit I feel well. Professor Rodoman deserves a monument for creating this medicine». Clara Hatesullovna M: «So, nonspecific ulcerative colitis is an autoimmune disease. Thanks to your Immunovit it does not return. Two years have passed, and I still feel well. I have been taking Immunovit since November 2004… I have a feeling as if a benign force were keeping my entire body in sanity and calm. I do not take any drugs apart from Immunovit. I owe you a big thank you, Professor!…». And though everything relating to Immunovit requires further research, Professor Rodoman already has every reason to claim that a combination of a great number of natural vitally important elements has the power to protect the body from a wide range of adverse effects. This hypothesis has been proved by a lengthy program of experiments. Here is an example. Mice were infected by pathogenic staphylococci. Every single mouse which had not been injected with the multicomponent Immunovit fell ill with pyelonephritis. The mice that had received the substance under test either did not develop the illness at all or had a light form of it. Here is another example. Mice were injected with a lethal poison. Thanks to Immunovit 60% of them survived. They were killed 4, 6 and 8 weeks after the injection. I would like to note that the mice who lived more did not display any organ pathology histologically. Tests also proved the non-toxic nature of Immunovit. We will refrain from providing all the favourable opinions by researchers, with many distinguished doctors among them. We will try to summarize the results of medical treatment with Immunovit. After a one-month course of treatment the number of SD-3, SD-4, SD-8 lymphocytes doubles, or, in other words, the immunity level increases considerably. All of the opinions note restoration of cellular and humoral immunity, improved metabolism regulation, enhanced virus sensitivity to specific drugs as well as increased reserve powers of the organism depleted by bacterial and viral infections. Last year Professor Rodoman had 800 patients treated with Immunovit. The results are impressive: the patients recovered from atopic dermatitis, different forms of allergy, even bronchial asthma. Many patients with severe cases of tuberculosis displayed a considerable improvement of all objective indicators with bacillus Kochii ceasing to figure in tests. A patient from Africa infected with AIDS who literally was on the verge of life and death returned to normal life. And though it sounds somewhat sensational, this person does not conceal his name, speaks about his case freely, and his letter is authenticated by his attending doctor. Many subjects relating to Immunovit have been made public through articles in the medical press and conference speeches, and the ambassador of the AIDS-patient’s country to Russia turned to Professor Rodoman requesting all of the information on Immunovit – the medicine aroused interest among the doctors in the state that he represented. One of Immunovit’s indirect effects is also worth mentioning: a several months’ treatment course defeats Hepathitis C. All of these cases are well documented by laboratories; moreover, some of the reports are substantiated by research done before and after the use of Immunovit at the Central Scientific Research Institute of Epidemiology attached to Russia’s Ministry of Health. Two centuries ago the great Russian doctor Matvey Mudrov taught his young colleagues to treat the patient and not the disease. A healthy organism has the forces to overcome the illness. This idea lives on, embraced and enhanced by a Russian researcher – Vladimir Rodoman - Doctor of medical sciences, Professor of Urology, Laureate of the USSR State Award, Member of the International Academy of Higher School Sciences, Honored worker of sciences of the Russian Federation. Vladimir Rodoman’s motto is: «The one to be treated is not the disease, but the patient, thus the organism will be able to defeat any disease because the ultimate reason for any disease is immunodeficit». Many times in his years-long surgery practice Professor Rodoman had to fight the annoying hospital infection disastrous to the patient’s organism weakened by the illness. And even brand-new antibiotics often did not prove effective enough: at first they stopped the inflammatory process, but then receded, and the blue pus bacilli and other bacteria went on with their dirty business. Vladimir Rodoman was always interested in solving this perennial problem. To begin with, he tried to work out an objective method of evaluating the effect of various antibiotics on pathogenic flora. One of his methods consisted in adding various antibiotics into the vial with the patient’s urine. Due to the effect of the antibiotic the pathogenic micro-organisms displayed different behaviour. It appeared that when the colour of the liquid is intense and changes very fast the antibiotic increased the growth of bacteria rather than suppressed them! And though this experiment was made primarily for academic purposes, once again it confirmed that antibiotics presented no cure-all. Antibiotics, especially old ones, should be prescribed only selectively, on a case-by-case basis. No wonder international drug manufacturers have to continuously throw new generations of antibiotics onto the market. In light of this, maybe it is more rational not only to use anti-inflammation medicines, but also strengthen the inner forces of the organism so that it can defeat the illness itself. This idea is far from being new. Nevertheless, with new specific medicines constantly appearing it has faded if not forgotten. Somewhat disappointed in antibiotics, Professor Rodoman decided to call upon nature itself to help a sick person making it strengthen the immunity system. But how should this is done? Medicine already seems to have enough immunostimulants and immunomodulators at its disposal. Nevertheless, according to Professor Rodoman’s research, at first all of them cause an invigorating effect, but then lead to emaciation. The causes of these changes have not been investigated enough. But it is already known that continuous use of such medicines disrupts some intricate processes on the cellular level. It is clear that the immune system is a very delicate substance and should be treated with utmost care. All of these considerations led Professor Rodoman to the idea of empowering the organism with the help of natural materials. And he seems to have found a vein of gold. The product is patented, but due to the fact that it is a know-how, Professor Rodoman is unwilling to disclose all of the details. It should be noted that if the idea of creating such a complex medicine represented no interest, it would never have inspired a great group of researchers. Isolation of active elements from natural material was carried out not only by researchers at the laboratory of the department directed by Professor Rodoman but also by experts at a number of institutes of the Russian Academy of Sciences and Russian Academy of Medical Sciences. The laboratory of the Moscow State University Scientific Research Institute of A.N. Belozerskiy produced an expert opinion on the composition of this multi-component medicine. Immunity. The concise medical encyclopaedia. «Immunity is a method of protecting the organism from bodies and matters carrying genetically alien information» - a classic definition by R.V. Petrov – first director of the Institute of Immunology, member of the Russian Academy of Sciences, Russian Academy of Medical Sciences, Russian Academy of Agricultural Sciences. Professor Vladimir Rodoman, Laureate of the USSR State Award, Honored worker of sciences of the Russian Federation is director of a urology clinic. Patients with acute retention of urine are hospitalized almost every day. Very often surgery is needed, and it should be noted that here surgery is very efficient. And it is efficient not only thanks to the skillful hands of the clinic’s surgeons, but also because Professor Rodoman gives his Immunovit to the patients during preoperational and postoperational periods. The developer named it «Immunovit» because it normalizes the immunity. - «I have been searching for a method to make the organism immune to infections for more than 25 years, - says Professor Rodoman. – The ultimate reason for every disease is immunodeficiency. If the immunity system functions normally, the organism defeats the disease. But if the immunity gets impaired the infection wins. Nowadays there are a lot of methods of improving immunity: immunity correction, immunity modulation and immunity stimulation. But our medicine uses a different method: it does not specifically raise the immunity level; it provides the organism with everything needed for restoring the immunity depleted by the illness. And then the organism has the power to defeat any illness. - So, could we call it «a cure-all»? - The organism itself is a cure-all, it has the ability to cure itself if adequate conditions are created. Immunovit is a natural product consisting of a wide range of natural components, the full range of amino acids, a number of vitamins including B, E, D2 (it should be noted that their assimilation rate is 95%), vitally important macro- and microelements, such as zinc and selenium, rare polysaccharides, antioxidants and other biologically active components. Immunovit is a powerful regulator of metabolism on the cellular level that creates these adequate conditions for restoring immunity. And by the way, it is not a drug, but a food additive. - So, can a food additive defeat tuberculosis? How many patients have experienced the effect of your medicine? - 114 patients at tuberculosis hospitals and TB dispensaries in Moscow, the Moscow and Ivanovo regions have experienced Immunovit. Clinical tests have proven that the recovery rate is 90%. Certainly, the treatment scheme includes other medicines apart from Immunovit. Nevertheless, doctors recommend our medicine for wide use as part of a complex treatment scheme for tuberculosis as well as use by medical staff and relatives having contact with patients. - But what happens exactly? How does your medicine work? - This is what the staff at the Central clinical hospital №119 showed interest in. They carried out laboratory tests of the immunity status of 127 patients before and after treatment by Immunovit. The tests proved that Immunovit improved metabolism, increased capacities of microbe-fighting blood elements and the rate of anti-virus substances. Directors of departments where Immunovit has been used recommend it both for treatment and disease prevention, for improving general resistivity of the organism, especially before surgery or epidemics of the flu. - Could we say that many patients with a wide range of diseases walked through the door of your clinic? - Certainly. They included those with lymphogranulomatosis, eczema, herpes, abscesses, hepatitis… We were able to help many people. The medicine produced good results in the treatment of children prone to diseases at the Morozovskaya children’s hospital. It was given to children ill with bronchial asthma, micoplasmal pneumonia and other patients. The children, who earlier found themselves in hospitals almost every other month, now go to school steadily. And educational center № 31676 situated in the South-West district of Moscow reports that the sickness rate of the Immunovit-treated children fell to 4.7%, while the children who were not given Immunovit fell ill almost 5 times as frequently. Those Immunovit-treated recovered sooner, and the adults given this food additive found out that their high sugar level had decreased in the blood. - The range of patients treated according to your scheme includes those with hepatitis. The situation with this disease is very grave all over the world. Russia’s Health Ministry acknowledges that an epidemic of viral Hepatitis A and C has broken out in the country: today there are 7 million people with different forms of hepatitis in Russia. - Regretably, the current statistics do not reflect the true scale, especially given the fact that the disease has latent forms. There are no vaccines for Hepatitis C, as the virus mutates rather quickly; therefore all the treatment consists in prescribing Interferon and Ribovarin with only temporary positive effect and rather serious side-effects. Our medicine is good also for Hepathitis C and we witnessed numerous cases of recovery. Vladimir Rodoman shared his vision of how medicine will develop. Vladimir Rodoman: In my opinion, today’s medicine should be somewhat redirected: we must pay more attention to the natural non-specific immunity of the organism in the complex of treatment and preventive measures. You will ask why. Because it is necessary to listen to old wise men and remember one truth. Hippocrates used to say: «Cures should be made of food and food should have a curative effect». Socrates said: «The doctor treats but it is nature that cures». These words carry a very profound meaning. All medicines should be based on natural components. Besides, we must realize that it is a living organism that is a genuine cure-all for all diseases. I have a dream to make our people healthy. How can this be achieved? I believe that we must start treating future parents 6 months before the planned conception. The baby will not develop any diseases if his parents are healthy. From my years-long experience I would recommend that the immunity status tests of patients should be made in order to enhance medical aid. For considerations of economy only one indicator – SD4 – is sufficient for that. It is possible to introduce the test by the joint effort of the School of Medicine with the hospitals’ administration. In 1945 at the Nobel Prize award ceremony Alexander Fleming, who had become a laureate for the discovery of penicillin, said the following words: «It is vaccines, not antibiotics, which have a future». He was right in the first case but wrong in the second one. If only vaccines could ensure 100% protection! After all, all babies are vaccinated against tuberculosis, so it should not occur in the country. This shows that vaccination is not as effective as is commonly believed. And do you know how harmful antibiotics are? They destroy the organism; reduce the function of the immune system, cause dysbacteriosis and allergy. And if a person has a weak immunity, his organism is unable to fight diseases. In treating certain cases of acute forms of kidney and urinal diseases we did without antibiotics and received positive results – much better than in the treatment with antibiotics. No wonder, since 2004 the American Academy of Pediatrics and the American Academy of Family Practitioners have been recommending so called «attentive waiting» without using antibiotics when treating babies for ear acute diseases if the patients display moderate clinical symptoms. We used a medicine which consists of natural components regulating the composition of intercellular fluid. So, to my mind, future belongs to the system of innate, non-specific immunity of the organism. to transmit the disease from man to man only one amino acid is missing. The inter-species barrier has already been overcome. «I believe that a bio-additive will have a positive effect only if it is proved that the patient experiences a deficit of components which make up this bio-additive. A man’s organism can easily self-regulate and its anticellular fluid can absorb only such components that are too few for the cell to function normally. The Pauling system may serve as a vivid example here. Linus Carl Pauling was awarded two Nobel prizes, the first for application of big doses of the vitamin C and the second for the «Pauling system». Large-scale verification of the Pauling system revealed that it produced good results only in cases with people who experienced a deficit of this vitamin. In other cases the result was nil». CALL us: (+7 9IО) 42О9765 (and Whats App) or (+7 925) 5I266О8, or (+7 495) 97I-ОО85. Correction: 5th of March 2019.